I’ve had my eye on the smart speaker market for a handful of years now. Not just because I’m a gadget nerd, although that doesn’t hurt, but because I’m obsessed with podcasts and could see the utility in a computing device that was almost entirely interacted with through voice. These products were never practical for me, though. Up until this past fall, my wife and I lived in a small apartment with a nearly-closet-sized kitchen, which always seemed like the most suitable location for a smart speaker. But power outlets and counter space were at a premium. I had dabbled with connecting a set of speakers to an old AirPort Express, but they were quickly ousted when we needed the counter space for food preparation and storage. One of the reasons we purchased the house we’re in now is the size of the kitchen. My wife and I love cooking at home and the new place has two or three times as much counter space as our apartment did. This, of course, means that we finally had space for a smart speaker in our lives. In my younger years, I probably would have ordered an Amazon Echo in the car ride home from our closing, but I have a bit more patience these days. Apple had already announced the HomePod when we signed the paperwork and the last time I purchased a piece of Amazon hardware it ended up in my desk drawer a few months later. The second-generation Kindle was no match for the original iPad. I didn’t want to go through that experience again. So I waited for Apple to release their entrant into the smart speaker market. It was delayed a bit, which was lame, but I remained patient. And when I woke up the morning of pre-orders, I purchased one in space gray. From the moment I slid the top off of the box, I knew the HomePod was a premium product. It features a sleek glass touch panel up top, a futuristic spongy material over the speaker and microphone arrays, and a rubbery base that will keep the unit from shifting during playback. The HomePod is deceptively heavy. You notice its weight while carrying the shipping container, but it isn’t until it’s unboxed before you realize that the packing material isn’t adding much to the heft. But it’s the good kind of heavy. The kind of heavy that reassures you that the $349 you spent on a speaker wasn’t just for the logo — it’s made out of high-end materials and built like a tank. You may have heard about the HomePod’s power cable — either on Twitter or in one of the myriad product reviews — and I can say without hesitation, the hype is real. 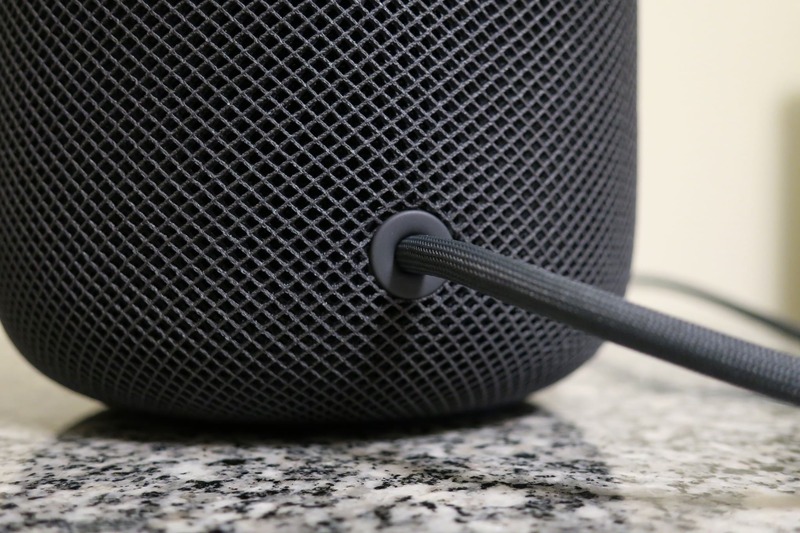 Now I’m not one to complain about Apple’s cables, I haven’t experienced the rapid fraying and splitting that others have, but the HomePod’s power cable is almost certainly the nicest I’ve ever seen. It’s wrapped in a durable, braided material and feels like it’s built to last. The size of the HomePod was a bit surprising to me. I was aware that it was larger than the Google Home and Amazon Echo, but I don’t have much experience with those products. The HomePod was just a bit bigger than I expected. Not to say the HomePod is too large, by any means. The device fit on my kitchen counter just fine without dominating the space, but it’s not exactly something you could hide in a corner and forget about. Overall, the hardware design of the HomePod is top-notch. It’s comparable to the AirPods or iPhone X in regards to their superb materials and near-flawless build quality. There’s no gaps where two materials meet or any noticeable inconsistencies to speak of. It’s just a well-manufactured product that was designed by a team with an incredible attention to detail. An unhappy discovery after we placed a HomePod on an oiled butcher-block countertop and later on a wooden side table was that it left a defined white ring in the surface. Other reviewers and owners (such as Pocket-lint, and folks on Twitter) have reported the same issue. 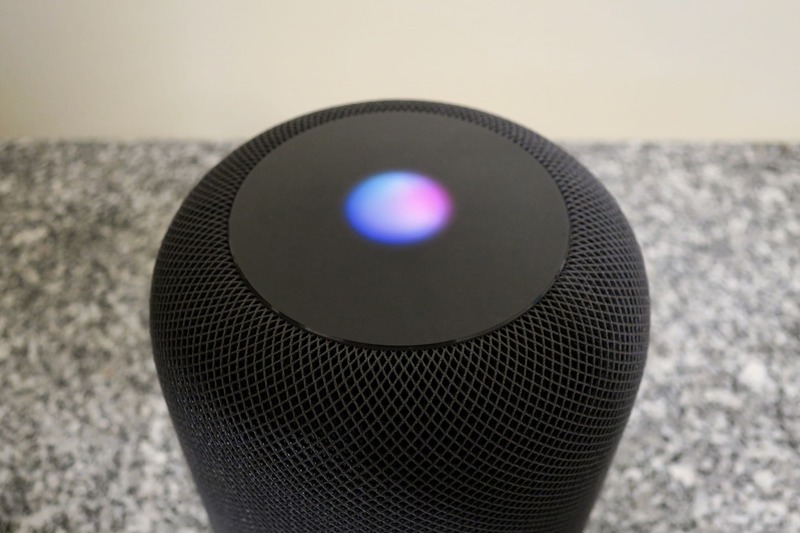 Apple attributes the problem to the oils diffused between the speaker’s vibration-dampening silicone base and the wood, and suggests wiping the marks off with a damp or dry soft cloth, or else moving the HomePod to a different surface. An Apple representative added over email that “the marks can improve over several days after the speaker is removed from the wood surface,” and that if they don’t fade on their own, you can “try cleaning the surface with the manufacturer’s suggested oiling method”—in other words, go refinish your furniture. This really undermines the design aspect of the HomePod—especially if you were thinking of displaying it on some prized piece of furniture—and it will surely be a sore point for many potential buyers. In other testing, we have seen no visible damage when using it on glass, granite countertop, nice MDF, polyurethane-sealed wood, and cheap IKEA bookcases. I suspect that most HomePod owners will never come across this flaw, but for those who do, it will be infuriating. The least Apple could have done was communicate with customers about the problem beforehand. But ideally, they would have designed their speaker without the flaw at all. I don’t think this should deter the majority of customers from purchasing a HomePod, though. In most circumstances, you can place it on another surface or put something underneath it to prevent the white rings from forming. It’s a bit lame, I know, but it’s not much of a hassle to deal with as long as you’re aware of it. And it’s worth noting, HomePod isn’t the only smart speaker that has this issue. Setting up the HomePod was just as easy as you’d expect. Plug in the power cord, hold your iOS device close by, and follow the on-screen instructions. You tell the software what room the HomePod will be in, it asks if you’d like to enable personal requests, and than it prompts you to transfer your Apple accounts and Wi-Fi settings. And that’s it. The HomePod’s ready to go. I have kept the personal requests feature disabled on my HomePod. I’m not exactly worried that some prankster in my circle of friends is going to respond to my messages or add items to my to do lists. But the HomePod is only tied to a single user’s iCloud account. I didn’t want to start using features on the device that my wife couldn’t. I want the HomePod to be our smart speaker, not just mine. It matters to me that she’s able to get just as much out of the HomePod as I do. If I started creating notes or adding items to Reminders from the device, she would inevitably ask if she could do so too. And when I broke the news about the HomePod being tied to my account, it might steer her away from using it at all. I would prefer to avoid that if possible — $349 is a lot to spend on a speaker that only one person in the house uses. Hopefully, Apple will add support for multiple iCloud accounts in the future with the ability to recognize each users’ voice. I’d be more than willing to enable personal requests, at that point. But until then, I’ll keep the feature disabled. The HomePod has three input mechanisms — the touch panel, Now Playing in iOS Control Center, and Siri. This feels like a great assortment of options, all of which can be quickly accessed based on your current context. In my two weeks with the device, I actually found the touch panel to be surprisingly useful. It features plus and minus buttons for adjusting volume and you can tap just about anywhere else on the glass to perform a handful of functions — tap for play/pause, double tap for next track, triple tap for previous track, as well as tap and hold to activate Siri. If I‘m right near the HomePod and my hands aren’t covered in food, I typically just use the touch panel to control playback. Apple was very generous with the tap targets — you can basically just slap anywhere on the glass and the HomePod will do what you wanted it to. Even the volume buttons allow for a fairly large margin of error, which you wouldn’t expect given their visual representation on the device. There’s no need to be precise with your taps and, more importantly, there’s no delay between your input and HomePod preforming the action. With iOS 11.2.5, Apple added new functionality to Control Center’s Now Playing platter. 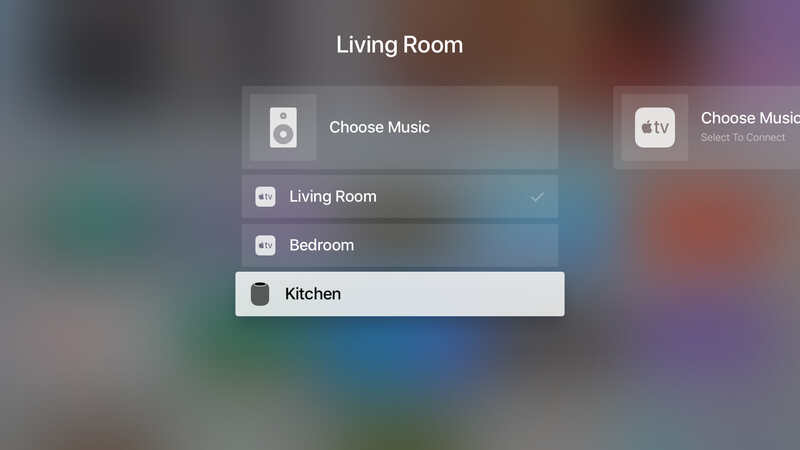 If you have Apple TVs or HomePods on the same Wi-Fi network as your iPhone or iPad, it will display playback controls for each of those devices. This is especially convenient if you’re listening to audio from a distance, where Siri wouldn’t be able to hear your commands. I haven’t used this feature more than a handful of times, but it works well. There’s almost no delay between tapping a control on my iPhone and the HomePod responding to the input. And it’s the only way to see what the device is playing without using your voice. 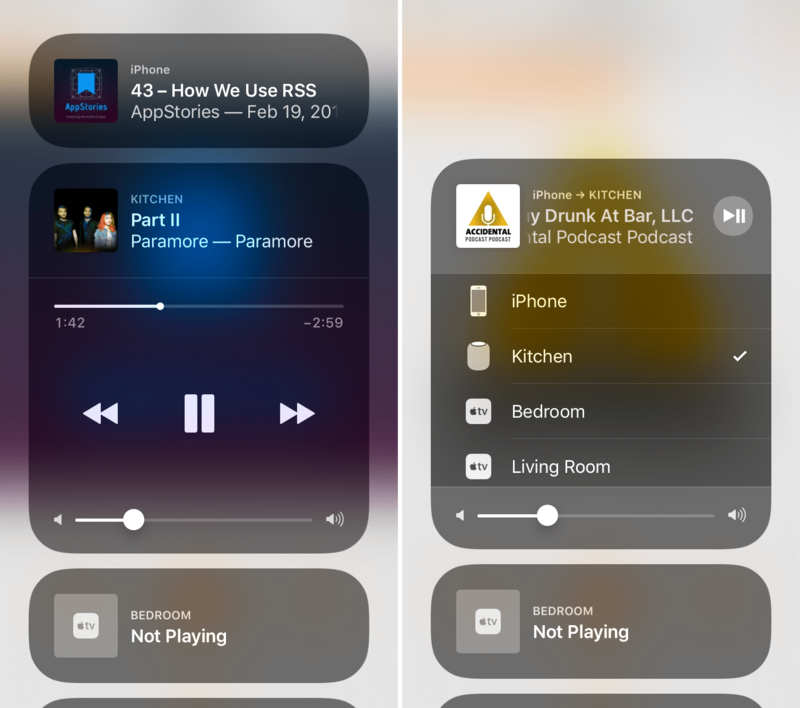 One thing of note about the Control Center playback controls for HomePod, is that it helped me uncover an annoying bug that cropped up three or four times during my two weeks with the device. Occasionally I would ask Siri to playback songs from an artist or album, she would respond as if the request was understood, and then nothing would play. In Control Center on my iPhone, I could see the HomePod rapidly rotating through each of the songs before finding one that it could actually play. My suspicion is that this is tied to my use of iTunes Match instead of Apple Music. But I wasn’t able to determine if HomePod was only skipping tracks that I had uploaded from my iTunes Library or if it was skipping any track that wasn’t already cached on the device. Or it could just be some weird Wi-Fi connectivity issue. Luckily unplugging the HomePod and rebooting always fixed the problem, but I’d like to see Apple address this in a software update soon. The real star of the show for interacting with HomePod is Siri. Simply start a phrase with the wake words — “Hey Siri” — and ask the device to play some music, tell you the weather, read the latest news, and so on. What Siri is capable of on HomePod is severely limited compared to other smart speakers from Amazon or Google, but I think Apple made the right compromises with their first-generation offering. I fully expect Apple to continuing adding to Siri’s capabilities, but out of the gate, I think Apple was smart to focus on a small number of areas. I would rather Siri have a handful of features that are executed well, with more coming in the future, than to ship with dozens of half-baked abilities that I wouldn’t be able to rely on. In my time with the HomePod, it has only failed to respond with a sufficient answer in one instance. I was cooking pork tenderloin and, on a lark, asked Siri what temperature it should be cooked to. She responded by saying “I can’t get the answer to that on HomePod.” Now, that was disappointing for sure, especially since I believe HomePod is at it’s best in the kitchen and I expect this might be a common query. But I would rather it fail than give me an unusual or incorrect response — I wouldn’t want to get sick because my HomePod told me to cook our pork to the wrong temperature. Of course, it’s certainly possible that I haven’t run into too many Siri failures on HomePod because I have been subconsciously avoiding certain questions because I’m aware of what Siri is capable of. But my wife, who isn’t obsessed with this stuff like I am and has used the HomePod more in these two weeks than I have, has only had Siri fail on her once or twice. That’s a successful rate in my book. In our daily lives, Siri has been more than capable of handling the vast majority of what we’ve thrown at her. Activating HomeKit devices, controlling audio playback, and asking about the weather have been our most common queries. And that fulfills nearly all of our needs in a smart speaker. That might change in the future as our expectations grow, but for now, it’s quite good. The HomePod is an incredible speaker. I can’t compare it to the Amazon Echo or Google Home because I have next to no experience with those devices, but the HomePod sounds better than any other speaker I’ve owned. To be fair, I’m not exactly an audiophile. But the bass was strong without overpowering the rest of the music and there was enough clarity in the vocals and instrumentals to feel like I could focus on each aspect of the music without any of it sounding muddy. What’s most interesting about my experience listening to music on the HomePod compared to most others is that I’m not an Apple Music subscriber. I’ve kept my music library in Plex for a little over a year and use Plex’s iOS and Apple TV app for playback. Since Apple hasn’t added support for third-party audio apps in SiriKit, this left me with three options — subscribe to Apple Music, subscribe to iTunes Match, or utilize AirPlay for all of my music playback. The last option, while technically possible, wasn’t even considered. AirPlay is a fantastic feature and I make use of it regularly, but it’s too much of a barrier to entry for everyday use. The extra step of initiating AirPlay to the speaker means that we might simply play audio through our iPhone’s speakers to save ourselves the trouble. I didn’t want that. If we were going to spend $349 on a smart speaker, we need to be able to initiating music playback with our voice. We already have a decent collection of music purchased through iTunes, which the HomePod can play with or without an iTunes Match or Apple Music subscription, but we still listen to albums that we ripped from CDs more than a decade ago. This left us with either iTunes Match or Apple Music. 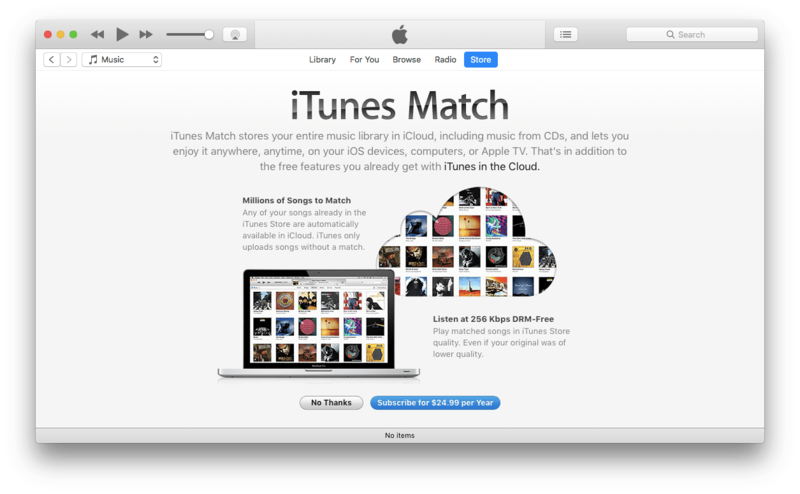 There’s pros and cons to both, but we ended up choosing iTunes Match because it’s far less expensive than Apple Music. My wife and I don’t discover and listen to new music often enough to justify the cost of a subscription service. It still makes more sense for us to purchase a handful of albums each year than pay $10-15 a month for Apple Music. iTunes Match doesn’t offer all of the “Musicologist” features that Apple Music does, with automatically generated playlists and whatnot, but it works just fine for our needs. It does mean I’ll have to maintain my library in two locations — Plex and iTunes. But I was already adding music to Plex by hand anyway and, as I mentioned above, we don’t acquire new music frequently. One major gripe I have with all smart speaker interfaces — which manifests itself in just about everything that you do with it, but is simply an inevitability of a screen-less device — is the lack of serendipity. It’s mitigated in some ways with Apple’s personalized playlists on Apple Music and the ability to shuffle all of your music with iTunes Match. But without a list of albums to scroll through, there’s no way to browse your collection and happen upon a forgotten album. I don’t know about everyone else, but I can’t keep more than a handful of albums or artists in my head at any given time. On the HomePod, I found myself requesting the same few albums and artists every time I entered my kitchen. I suppose this isn’t too much of a problem. You can always relegate music discovery and serendipity to your iPhone or iPad and stick with your recent favorites on HomePod. But this realization puts a damper on how impressive it is to instantly playback nearly any song you could ever think of — if you’re only playing the same handful of albums, what’s the point of all this extra technology? Of course, this doesn’t just pertain to the HomePod and isn’t something that’s worth going in too deep about within the context of this review. But it is worth considering if you’ve been thinking about purchasing such a device. I still believe I get enough value from the HomePod, but for others, it might not be worth $349 for a speaker that you never play more than a handful of albums on at any given time. But of course, the HomePod isn’t just a music speaker, it can control HomeKit devices, receive audio over AirPlay and playback podcasts. My wife and I have five HomeKit devices at the moment — three indoor iDevice Switches, an outdoor iDevice Switch, and an Ecobee 3 lite. They add an astounding amount of convenience to our lives and the HomePod is able to control them with ease. Walking in from our garage with both arms full of groceries and being able to just tell Siri to turn on the lights is simply delightful. We were already on board with HomeKit, but owning a HomePod has accelerated our interest in the ecosystem. We plan on purchasing one of those light bulb adapters for our kitchen soon — most likely the iDevices unit — and maybe a few more switches to outfit the rest of our house. It’s an excellent protocol with a bright future and I expect HomePod will play a pivotal role going forward. And then there were podcasts. I spend the vast majority of my listening time with spoken audio in my ears — shows like Cortex, Accidental Tech Podcast, and the recently revitalized The Menu Bar, to name a few. But I haven’t spent a ton of time listening to podcasts on the HomePod. I use Overcast as my podcast client of choice and, as I mentioned before, you can’t use Siri to playback audio from third-party applications. You can tell Siri to play the latest episode of a specified podcast, but unless you use Apple’s podcast app, you’re playback position won’t sync with your primary player. I have used this feature for a few shorter podcast episodes and then deleted the episode in Overcast once it was completed, but there’s no way I’m going to do this with any regularity. It’s just too fiddly. Ideally, Apple will add audio app support to SiriKit at WWDC. Or at least, that’s when I hope the feature will be added. In the meantime, if you want to use a third-party audio service with your HomePod, you’ll have to do so over AirPlay. It’s not as pleasant to use as Apple’s first-party services, but at least we have the option. There’s a small delay on the audio, which is mildly annoying, but you can still use many of the same voice commands to control playback — play, pause, and skip forward or backward thirty seconds. We don’t just use AirPlay for Overcast, though. When my wife and I have friends or family at the house, we like to play a different mix of music from what we normally listen to. We have historically paired a Bluetooth speaker to our iPhone and played music from Pandora, but now we’ll be able to AirPlay music from Pandora’s Apple TV app to the HomePod. This gives us a large interface for choosing music, that everyone in the room can offer suggestions on, and a speaker closer to the areas of the house where we tend to congregate — the kitchen and dining room. This setup has worked well and has been a hit with the guests we’ve had over recently. Especially with how easy Apple has made it to send audio from an Apple TV to an AirPlay speaker. For applications that use the standard system playback interface, simply swipe down on the Siri Remote’s trackpad while the media is playing, swipe over to the Audio tab, and choose you’re desired destination. And for applications that don’t use the standard interface, jump to the Home Screen, hold down the play/pause button, and choose which AirPlay device you’d like to send your audio to. The HomePod is a tremendous product that has quickly integrated itself into my daily life. I use it in the morning for weather forecasts, we listen to music on it while my wife and I cook dinner, and I use it for podcast playback while I’m doing dishes. It has its faults, but I think purchasing one was a wise decision. It might not be best for everyone, though. It’s a bit more expensive than competing products and has a limited set of features at the moment. Whether the HomePod is right for you depends a bit on what’s most important to you in a product like this. 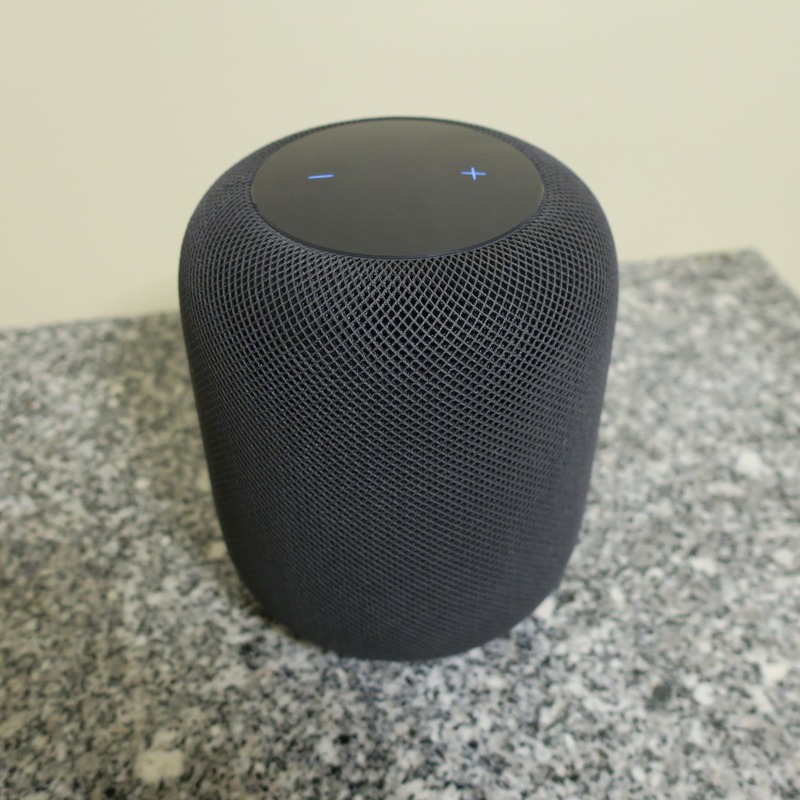 If you want a superb sounding speaker that works well with your existing devices, looks great on a kitchen counter, and can tap into Apple Music, the HomePod is right for you. But if you want something that’s cheap, works with Spotify, and integrates with hundreds of third-party hardware and services, it might not be. Put another HomePod in the same room and they automatically detect and balance each other. With advanced beam forming capabilities, a HomePod pair is able to create a wider, more immersive soundstage than a traditional stereo pair. I believe Apple has even more features in store for the future of HomePod. I think we will eventually see support for third-party audio apps in SiriKit. Which, assuming developers add support for it, could let you initiate playback of audio from Spotify, Pandora, Overcast, and more using only your voice. There’s also the potential for Apple to add support for multiple iCloud accounts or the ability to connect to HomePod over Bluetooth with non-Apple devices. All of these additions could change the value proposition of a $349 smart speaker. But I wouldn’t suggest that you purchase a HomePod with the expectation that these will be coming in the future. If you’re on the fence at all, just wait. In the meantime, maybe pick up an Echo Dot or a Google Home Mini to see if a smart speaker is even something you’d enjoy having. You might find that it doesn’t fit well into your life. And you can always revisit the idea in a year or two after Apple has added a number of new features to the software or expanded the lineup with an inexpensive HomePod Mini. But if the HomePod sounds like something that does enough for you today, even with the relatively expensive purchase price, then get one. You’ll be very happy with it.